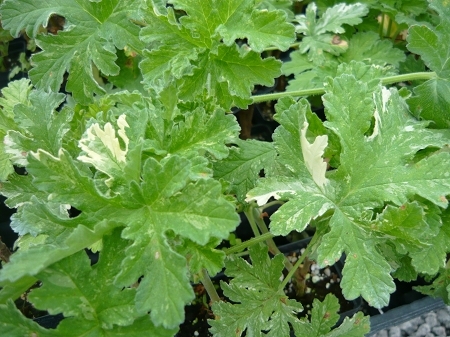 Peacock Rose Scented Geranium - Deeply divided light green leaves are variegated with splashes of white and have a mild rose scent. Small pale purple flowers when in bloom. Robust upright growth habit needs plenty of room. Perennial zones 10-11+ Like other scented geraniums requires plenty of sun and a well drained soil. Live starter plant in 3" container. All I can say is WOW! Received this plant today in the mail. Always a bit of a gamble, if you ask me, but I am impressed as to how meticulous the plant was packaged and that it arrived in such great shape. The fragrance is fantastic, a citrus-rose floral note, in my opinion. (Hey, smell is subjective) Just ordered several different scented geraniums. Can't wait. I want to collect them all! !